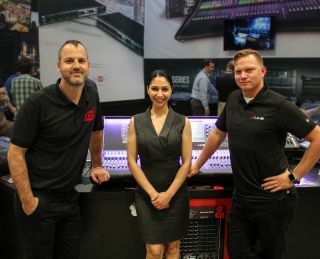 Allen & Heath has expanded the marketing team based at its USA distributor, American Music & Sound, with the appointment of Mike Bangs as Live Sound & Touring expert, James Duvall as Commercial Solutions Specialist and Maryam Larki-Bavi as Marketing Manager. The new team has a wealth of audio experience and will support customers across the live touring and installation spectrums in order to develop the Allen & Heath brand in these market areas, and to ensure continued success for Allen & Heath under the umbrella of American Music & Sound in the U.S.
Maryam Larki-Bavi joins Allen & Heath with an extensive background in the pro audio industry, previously holding marketing positions with Harman Industries and Sennheiser. In her new role Ms. Larki-Bavi will steer and oversee all aspects of marketing for the Allen & Heath brand in the U.S.
Mike Bangs comes to Allen & Heath as a veteran in the touring world with an all-encompassing sound engineering and production management experience from many national and international tours, such as Katy Perry, Eric Clapton and Aerosmith. Mike is in charge of growing the Allen & Heath business in the touring market and supporting high profile events, artists, engineers and sound companies as the new Live Sound/Touring expert. James Duvall brings hands-on audio engineering and systems design expertise to the team. In his new position as the Commercial Solution Specialist, Duvall will assist consultants and integrators in system design and product application for Allen & Heath products.